Madhya; Meshurana, Jeevana (Livelihood), Rajaspadada (Kingdom), Sat (Good), Kriya (Work), Vyapara (Commerce, trade, business), Jaya (Success), Aspada (Rank or Position), Achara (Good Conduct), Mana (Honour), Sacrifice, Agya, Ajna (Command), Guna (Quality), Artha (Wealth), Gamana (Gait), Gnana (Wisdom), Pravritti (Inclination), Karma (Occupation). Tenth House represents occupation, rank, temporal honours and success, respect, means of livelihood, self-respect, religious knowledge and dignity. 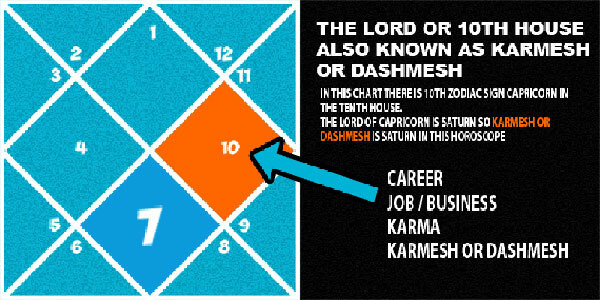 In Western Astrology, Tenth House is considered as the House of Father, as it is opposite to the Fourth House of Mother. In ancient times, father was also considered as a guru, hence Ninth House is also considered as the House of Father as well as guru. Rishi Parashara has also considered Ninth House as the House of Father and Tenth House as the ayu or longevity of father. The sign which governs the Tenth House in Kaal Purush Kundali is Capricorn and the Natural ruler of this sign is “Saturn”. In Uttara Kalamrita, Kalidasa says that information regarding trade, prosperity, honor from government, honorable living, pre-eminence, permanence, seal of authority, horse riding, athletics, service, sacrifice, agriculture, doctor, name, fame, depositing a treasure, talisman, morality, medicine, thigh, prosperity, adopted son, teaching, intellect to command and mantras are to be sought for through the Tenth Bhava. The author of “Jataka Desh Marga” says that it is through the 10th House that one ought to become divine’s about one’s honor, profession, dignity, position or rank. Bhattotpala says in Prasnagnana that Tenth House is used to observe matters concerning kingdom, seal of authority, great religious merit, position, utility, rain and things associated with the sky. In Satya Samhita, the author inclines to the view that Tenth House has to be examined in order to find out one’s worldly standing, rank and eminence as well as association with virtuous people. Prityushas, the son of Varahamihira, asserts that all information pertaining to one’s occupation, living, all about one’s valor, prowess, learning, fame, things seen and heard about a person are to be ascertained through this house. Ramdayalu in Sanketa Nidhi says that one’s occupation, family, happiness, etc., should be deduced through 10th house. One’s meritorious deeds, trade, occupation, livelihood, administrative appointment, happiness, position, action and devotion towards ancestors are to be ascertained from this house. The two knees and backbone of a person are governed by the 10th house. 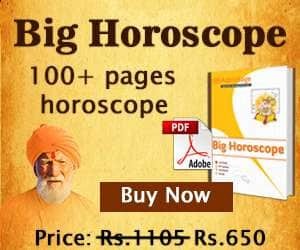 As per Astrology books, Tenth House represents all questions concerning one’s worldly activities and moral responsibilities. It shows one’s inclination towards permanency, promotion, advancement, appointment etc. and how one acquires superiority. 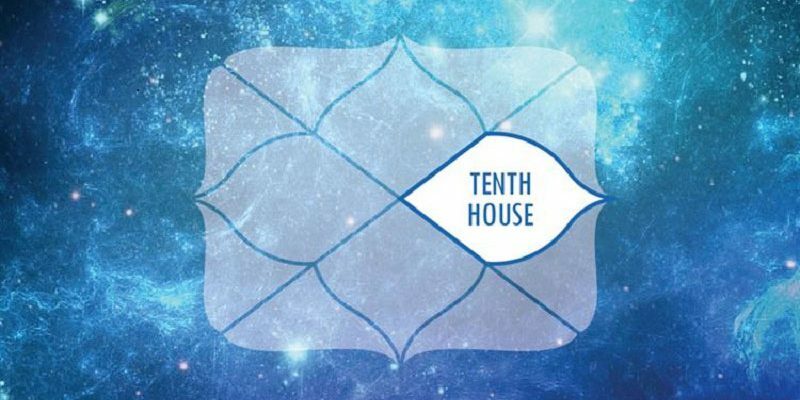 The main influence of Tenth House is upon profession, occupation or business. In daily life, you meet people who have no choice to choose their vocation, are neither skilled in that area nor have much skills to move forward with the same, whereas we also come across those people who are capable of changing their vocation several times in life, which means that they have the choices or more than one occupation at a particular period of time. Majority of you chose your vocation not as per your area of interest but for monetary gains. Mantreswara in Phaladeepika has used the very suitable word “Pravritti” in connection with the Tenth House. To understand about the profession, one should also take into consideration the second and sixth houses as well. Sixth House is important as it tells about service, routine, competition etc. and second house tells about self acquisition of wealth. Prarabdha Karma: It is a piece of Sanchit Karma alloted for the current life. Kriyamaan Karma: These are actual karmas which we perform in our current birth. Aagami Karma: Karmas which we will carry out in next birth. In case the current birth is your last birth, then you will get moksha. In Mundane Astrology, Tenth house represents kings, royalty, nobility, executive, parliament, administration, foreign trade, law and order. It corresponds to the president or prime minister, chief executive, government and person representing government as its head. This house rules the leadership and reflects upon the nation’s prestige and status among other nations. It shows top authority in state, parliament as per Vedic Astrology. Tenth House represents the Ministry of Industries-the king, royalty, government, ruling powers, aristocracy, nobility and society, upper class etc. In Horary Astrology, 10th house represents judges, judgement and substances taken by thieves. Other significations of this house can be correlated with other houses of the horoscope as well. It does not represent the vocation or occupation but the working environment. It acts according to Newton’s Third law of action and reaction. Once we interact within the working environment and how it is going to affect us, all depend upon the Tenth House in Astrology. It becomes your duty and responsibility to perform any task. As said, “As you sow, so shall you reap”, therefore whatever you will do, whether it is affecting you or others positively or negatively, all depends upon your karma or actions. It is very important to perform any activity in order to get the response or reaction from other things or beings. It represents the teachings from your father, understanding God, authority and government. You need to follow the rules and regulation of God or government. Anything beyond rules, you will not be allowed to perform any task. Hence Tenth House represent the authority or supreme power. It represents the wealth or teaching from your father, death of your father or guru, gains from long journeys, gains from your higher education, skills of your in-laws, communication style of your in-laws, happiness for your spouse, land and property of your spouse, real estate of your spouse, diseases, enemies of children, spouse of your mother (your father), hurdles in communicative ability, wealth used for religious deeds, gain from spirituality, decrease in your income or loss of your elder siblings. Three-years old house of father, happiness from father, iron, wood, aspect or vision, snake, buffalo, crocodile, crow, cleverness, black colour, black cow, brick, stones, a dark room with one door, pertussis (whooping cough) etc. all belong to this house of the horoscope. The planets occupying this house will nullify the effects of planets in the fifth house even if they are supporting each other. The second house will activate this house of the horoscope. 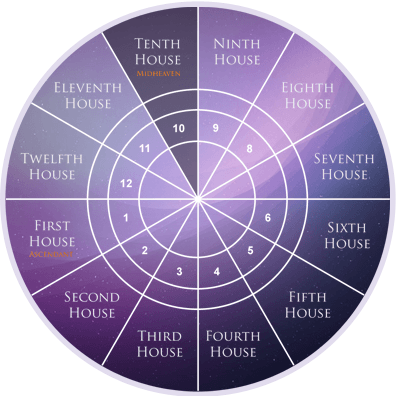 In conclusion, Tenth House is the most prominent houses among others. It tells about your reputation within or outside your society.